I've recently been on this kick of watching these gold digging shows. Mainly Gold Rush from Discovery Channel. The show is about this father/son team that gets together with their down-on-their-luck friends and decide that digging for gold in Alaska will solve all their financial woes. When talking about this show with others, I've come across a story about a gold mine right here in Utah: The Lost Rhoades Mine. Ever wonder where the gold for the Angel Moroni statue came from? Well me neither, but you're about to find out. It's a tale of drugs, money, secrets, visions and murder! Dun dun duuuuuuuuuuun. The story goes (according to Kerry Ross Boren and Lisa Lee Boren, authors of The Gold of Carre-Shinob ) that the Aztecs took a large stash of their gold north through Mexico to save it from being captured by Cortez, because it turns out Cortez wasn't so much a white-bearded god as he was a giant a-hole. They hid it in a place where they believed their ancestors came from: you guessed it, the Uintah mountains in good ol' Utah. The Ute Indians kept it safe and hidden--that is, until the Mormons showed up. After a smoke or two on the peace pipe (this is the drugs part) with Brigham Young, the Ute chief decided he wanted to show the gold to one Mormon, Isaac Morley. The chief later told Bro. Morley that he once saw Morley in a vision and his gods had told him that Morley would be the one to be shown the sacred gold mine. Bro. Morley convinced the chief to let him take the gold to Brigham Young. BY promised the chief he would use it for sacred purposes including the decoration of the temple and a statue for the top, like a big golden cake-topper. BY wanted to keep the gold under wraps (for obvi reasons) and, with the chief, decided that only Bro. 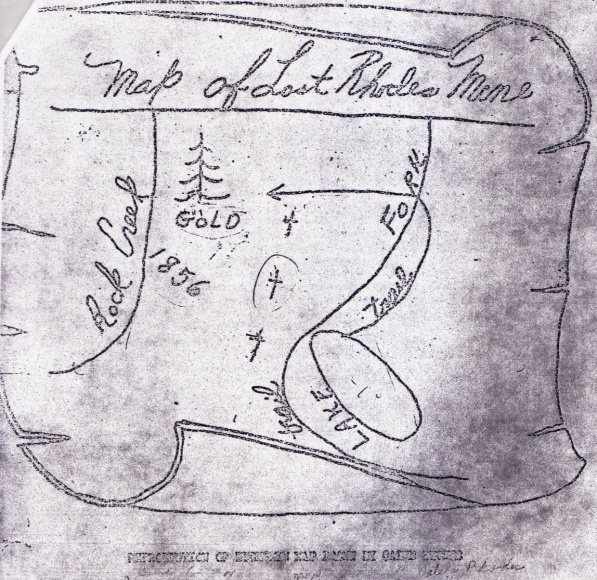 Morley would know where the mine was located. When Bro. Morley became too old, the calling of a lifetime fell to the eponymous Thomas Rhoades (why can't I get a calling like this?). One story goes that a doctor was in Rock Creek Canyon and found a giant metal door in the side of the mountain under some weeds. He tried to open the door but heard a sound and turned to find two Ute Indians behind him. They grabbed him, cut off his hand, and threatened him that if he ever came there again he would leave without a head. Apparently there are many other stories of people who, after hearing about this secret stash of gold, go out in search of it. And of course great tragedies strike those who get close--mostly horrible, horrible deaths. So, was this gold mine real? Was the gold inside used to fashion the Angel Moroni on top of the Salt Lake Temple? Did Sarah Palin really give birth to her youngest son, Trig? Heck if I know, but it makes for a good story. Like I said, I've never heard this story before, and perhaps some of you have, or have heard different versions. If so, would love to know what, if anything else, you've heard. In the meantime, if you need me, I'll be in the Uintah Mountains looking for a way to solve all my money woes.